Birthday Slideshows Make the Celebration Even Better! Make a birthday slideshow that is a gift all on its own. Our free online birthday slideshow maker can run in the background or be the centerpiece of the party! With Smilebox, you can make a birthday slideshow with flashy effects and tunes or keep it simple with your favorite pictures. Best of all, no matter what you choose, our birthday slideshow maker is easy to use. Birthday slideshows are entertaining to make and watch! Free online birthday slideshows save you time and money but don't skimp on fun. Choose a birthday slideshow template that's wacky and wild or sedate and serious. With our huge selection of specialized birthday slideshow designs, it's a no-brainer to find the perfect setup before you add your own artistic magic. Make a birthday slideshow for only a loved one, or for everyone on your mailing list. Smilebox gives you a huge range of sharing options so that everyone will enjoy your birthday slideshow inspiration. Email, post to social media, or save it to your computer - it's all possible with just a few clicks. Check out how easy it is to create a birthday slideshow sensation! It all starts with the birthday slideshow template. From funny to sentimental, Smilebox has it all. Click your selection, and then “Personalize”. Choose “Add More Photos” to start adding a virtually endless number of pictures to the birthday slideshow. You can upload your files from your phone, social media accounts, and your PC. The “Autofill” option will assign each image to a slide, but you can also manually add pics to the birthday slideshow. Make a birthday slideshow that expresses exactly what you want to say about the special boy or girl. Click the personalization panel (right side of the template) and use our numerous tools to change the color, text, and fonts of the birthday slideshow. You can also add music and animation effects. Want to see your birthday slideshow in action? Press the “Preview & Share” button or look at how your creation comes together on the display at the bottom of the screen. Give your birthday slideshow a once-over with “Preview and Share” and then let everyone have a look with our extensive sharing options. These include social media uploads, emailing, and saving on your PC. You will love the excellent quality that our program produces when the birthday slideshow is finalized. It will look simply amazing when you show it onscreen at the birthday party! Why limit yourself just to showing birthday slideshows at the party? 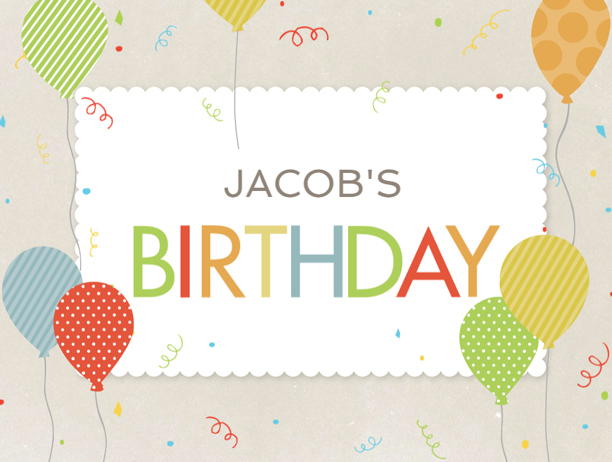 You can be creative with Smilebox's free online birthday slideshow maker far beyond its personalization features. Once you make a birthday slideshow, it can be used for many things. Use it for an invitation. Post it on the birthday boy or girl’s Facebook or Instagram. Or send it to your phone so that you can enjoy it for months or even years to come. Our free online birthday slideshow maker is easy to use. No design skills necessary – even grandmas are using it! Once you have created your first birthday slideshow, you'll practically be an expert. So, the next time that somebody's special day comes around, just log in and put your Smilebox skills to work. You'll never get tired of all the features and fun that we have to offer. There's an ideal birthday slideshow for everyone in your life, just waiting for you to discover it.